The above info came from Nelly Erickson, and was edited by yours truly (contact me). The image came from siliconera. 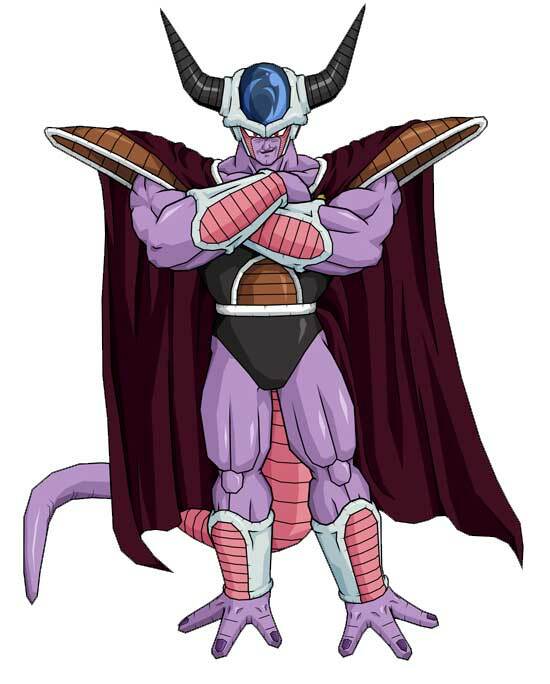 King Cold is the father of Frieza and Cooler and the leader of their race. He makes his first appearance when Frieza lands on Earth for revenge on Goku. But he is first mentioned when Goku and Frieza are fighting on Namek and Frieza says "this is the first time anyone has ever hurt me, besides my loving parents that is." Upon landing on Earth, Trunks comes from the future and destroys the soldiers. After Frieza is sliced and diced, he turns his attention towards Cold. Cold offers Trunks to replace his now dead son, but Trunks declines. He then asks to see his sword. Trunks gives it to him. Cold then strikes for revenge, but fails. Trunks catches the blade and blasts him through the chest, sending him into a cliff. In the English version, Cold pleads for his life, in the Japanese version, he offers Trunks his own system, but in the manga, he is killed instantly. In all versions he is killed by Trunks, although in Trunks' timeline, Goku kills him. He makes a few more appearances in later episodes. The above description came from Nelly Erickson, and was edited by yours truly (contact me).